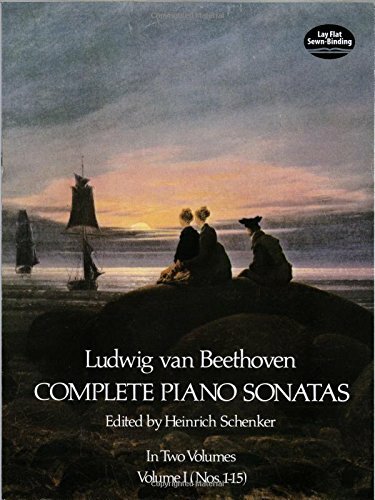 The entire corpus of Beethoven's piano sonatas is contained in this two-volume work — 32 sonatas in all. Volume One contains the fifteen sonatas from Beethoven's first period, including the popular Pathétique, Moonlight, and Pastorale sonatas. Volume Two contains the 17 sonatas from Beethoven's second and third periods, including the Waldstein, the Appassionata, and the Hammerklavier. The music is reproduced directly from the exemplary Universal Edition set edited by Heinrich Schenker. Combining scrupulous scholarship and profound artistic vision, Schenker achieved an edition which is universally admired by musicians and scholars. He used more autographs as sources than any previous editor of the sonatas, and he was the first to reproduce in print the visual impression of the autographs. For this Dover edition, Schenker's footnotes have been translated into English and his preface translated. A new introduction by Carl Schachter has also been included. Noteheads have been reproduced in a size large enough to be read easily at the keyboard. Margins and spaces between staves are generous, permitting insertion of written notes, analysis, fingerings, etc. Running measure numbers and many fingerings have already been included by the editor — the last a particularly unusual and valuable feature of this edition. This edition will be welcomed by all pianists, both professional and amateur, for its accuracy and reliability; it is highly desirable for instruction, study, reference, and enjoyment.